Scientific Name(s): Rigodium implexum Kunze ex Schwaegr. Few scientific papers make mention of Rigodium implexum. 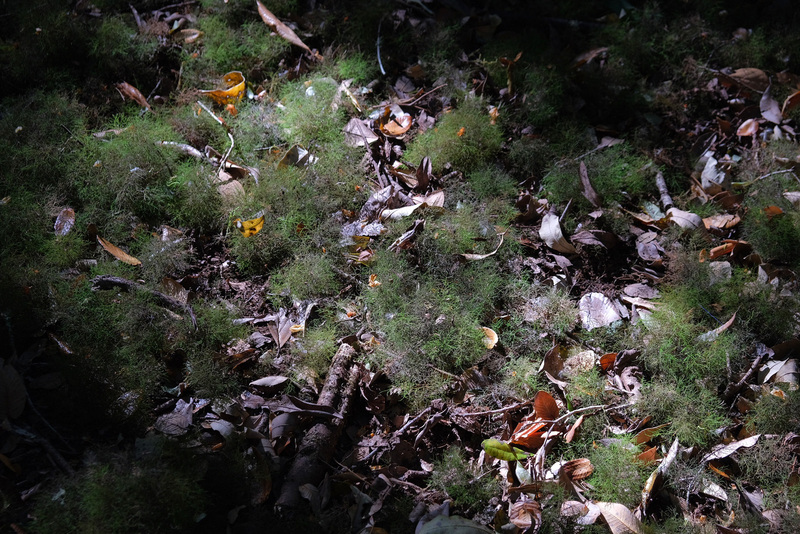 Among these, though, one leads with: “One of the most bizarre scenarios in bryology are the strange mossballs formed by Rigodium implexum Schwaegr. lying in masses on the forest floors of the Valdivian rain forests in Chile”. The International Dendrology Society 2019 tour to Chile did not disappoint when it came to observing a diversity of plants. I had prepared through books and field guides, so I generally had an inkling of what I was going to see. One of the few unexpected-to-me delights was Rigodium implexum, which was first encountered in a family estate’s old-growth forest of Nothofagus obliqua, Eucryphia cordifolia, Aextoxicon punctatum, Persea lingue and Laurelia sempervirens. Despite being late summer, the forest paths in some places were covered with these masses of Rigodium implexum; we were told that during the wetter parts of the year, nearly the entire forest floor had these. The mossballs of Rigodium, however, grow on the forest floor. They are 10-20 cm in diameter and usually lay in masses of several dozens to more than a hundred in shallow depressions, densely matted together, unattached to the ground. The leaves are minute, scale-like and hard to see with the naked eye. Occasionally they are found in smaller quantity, which may be a result of wind dispersal. Most floristic publications do not mention this strange life and growth form, which cannot classified into a known category. Almost nothing is known about the biology of these mossballs. Zomlefer (1993), in her monograph of the genus, gave a description and a distribution map, but: how do they propagate? are they blown by wind through the forest? (which is unlikely in such dense forests); are they dispersed by birds? (which is unlikely because of their size); are they regenerated from fragments? (which is unlikely, because of their perfectly centered branching; are they propagated by spores? (occasionally single sporophytes can be found); how do they get their nutrients? ; and are the depressions filled with water after rainfalls or in the rainy season or do they live from atmospheric humidity and nutrients? Details about the habitat are also not known. 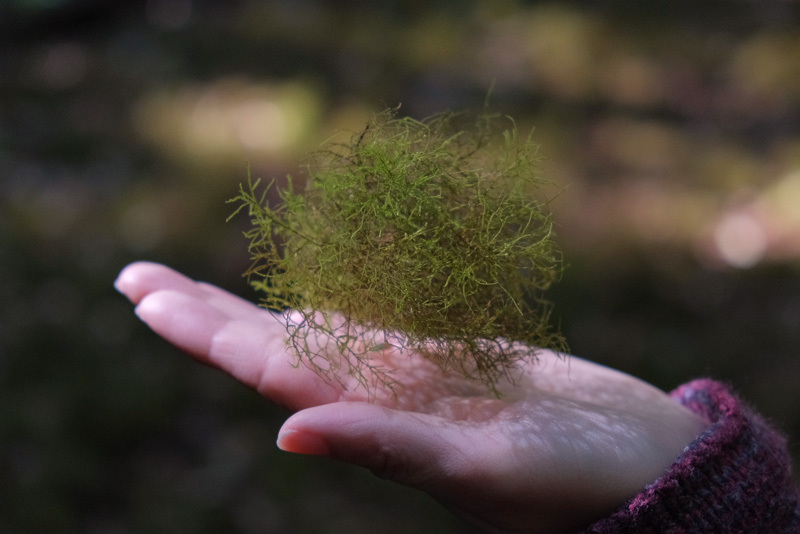 It was pleasantly surprising to me that a group of people with trees as a primary interest could be distractedly intrigued by a species of moss. While its identity was a mystery at first, eventually learning the name just led to more questions as we read the above. Additional photographs are available from Chilebosque.cl: Rigodium implexum. And another photo, complete with hand model. Since these are not attached to anything on the forest floor, I don’t think any harm was done to this moss (especially since you could step on them and they’d bounce back). Ha, that’s what Douglas Justice called them when I showed him the photographs! I love that there is still so much to learn about our planet! Those are amazing. Fascinating! Simply fascinating. I hope we learn more about these mysterious plants. Absolutely fascinating. I just love moss and lichens. Well, also Marimo. The local name is, of course, “lana de pobre”, not “probre”. I think Theodor Herzog was the first to record the name in 1939 in “Zur Bryophytenflora Südchiles”. Chilean papers from 1978 and 1989 used “lana del pobre”. One of the botanists did describe them as “loose on forest floor like tiny tumbleweeds”.